If the news from Japan during the last decade has concentrated on the depressing symptoms of decline of what once had been hailed as a miracle model of capitalist development, the announcement last year of the establishment of the New Associationist Movement in Osaka and Tokyo and the publication of its Principles (Genri, Ota Shuppan, Tokyo, 2000) reveals hitherto unsuspected vital signs still ﬂickering as proof of life in a moribund cadaver. The enunciation of the Principles of the New Associationist Movement contrasts dramatically with tiring doom-ridden accounts, gleefully reported by the Western press, of violent adolescent crime, political arteriosclerosis in Japanʼs ruling body and the one-party democracy led by the Liberal Democratic Party, decennial recession with no prospect of ending, an occasional natural disaster and the disappearance of a critical culture choked by an ideology of consensus bought by the illusory promise of economic wellbeing and lifetime job security. Perhaps it is ﬁtting that a country that set the standard for advanced industrial nations in bonding the necessities of the state to global capital at the expense of civil society, and thus preﬁgured by decades the gutting of democracy now being experienced in the United States, UK and Western Europe, has now been called upon to give birth to an idea of association and a movement devoted to undoing the damage of neo-liberalism and its offspring, savage capitalism. Yet, it is also signiﬁcant that both critique and association exceed an exceptionalist perspective. This is not Japanʼs contribution to the cosmopolitan chorus of humanity. Japanʼs most gifted critic, and a number of associates including the economist Nishibe Makoto, the lawyer Kuchiki Sui, the critic and economist Asada Akira and others, even though there is no formal organization as such, and no leader since its members are all equal representatives. Although the Principles has been produced by a collective, its leading ideas clearly derive from Karataniʼs earlier book, with Yamashiro Mutsumi and Nishibe Makoto, Possible Communism, published in 1999. The purpose of NAM is to ʻachieve a clear perspective on the abolition of capitalism and the stateʼ and to combine a number of dispersed movements into a new association pledged to realizing the goal with methods that no longer belong to either socialism or anarchism but plainly originate from both. ʻThe NAMʼ, according to the Principles (No. 5), ʻis a realistic movement that [works to] abolish real contradictionsʼ and will employ those devices produced by the same social development. In order to exploit the social potential inherent in the contradictions generated by capitalism, the ﬁrst task of NAM must be to interrogate rigorously the meaning of the historical experience of capitalism and social movements at ʻthe same time that it creatively confronts an unknown futureʼ. It is important to recognize that NAM seeks to distance this programme calling for the evaluation of the meaning of the historical experience produced by the ʻmarriageʼ of capitalism and the state from the ʻculturalismʼ currently practised by contemporary Marxists and their fellow travellers in cultural studies. Aware of the role played by the process of commodiﬁcation in Marxian discourse, the course of cultural hegemony and the necessity of critique, NAM discounts the critical practice of contemporary proponents of the ʻcultural turnʼ. Such a practice is taken to reveal nothing more than a ʻlurking desireʼ for a ʻproductionist centrismʼ that ultimately calls attention only to a fatal ʻdespairʼ. Entirely removed from labour movements, it ʻlacks a pointed position toward capitalist relations of productionʼ. By the same measure, NAM is neither workerist (though it does seek to realign associationism with transnational workers as consumers) nor historicist (despite its promise to evaluate the speciﬁc historical expedience of capital and state as a condition for confronting an unenvisaged future). The driving impulse behind the call for historical analysis of, especially, all hitherto socialist movements since the nineteenth century is a Kantian-inspired conviction (NAMʼs ﬁrst principle) that associationism must be both an ethical and an economic movement: ʻEconomy without ethics is blindʼ, just as ʻethics without economy is emptyʼ. NAM believes that socialism, at its outset, was an ethical rather than a natural necessity, and not just concerned with the realization of economic equality. Its ethical character not only differed from the morality of both state and community but was actively opposed to the constraints on freedom each imposed on its constituencies. Socialists were persuaded that the only goal of installing a genuinely free agent (in the Kantian sense) was to dismantle both state and market economy. But NAM recognizes from the history of the various social movements – utopian socialism, communism, anarchism – devoted to the goal of abolishing capitalism and the state, that they invariably failed to achieve their goal principally because they misunderstood the relationship between the two. While nation-state and capitalism have developed separately, they were bonded during the period of the monarchical state and thereafter established a modus of mutual interdependence despite their autonomous origins. By the time of industrial capitalism, state and capital were in a position to form an ʻinseparable amalgam at the same time as they still sustained their own autonomyʼ. NAM sees as the failure of previous socialist attempts to rid society of capitalism a blindness towards the particular partnership (NAM calls it a ʻmarriageʼ) of state and capital which led some to overstate the role of the former and others to concentrate on the latter and the market. ʻMarxismʼ, according to the NAM analysis, ʻsought to counter the power of capitalism by way of state powerʼ, only to risk transforming itself into another state power. Anarchism erred too much on the other side. Although it successfully called attention to how Marxism had become entrapped in state power, its own answer to the problem has never managed to exceed the ʻutopian dream of aesthetic transcendenceʼ. (Surely, NAM is thinking of Japanese anarchists like Osugi Sakae and not their French or Spanish counterparts.) In NAMʼs analysis, all of the failed efforts have resulted only in the afﬁrmation of capitalism through the political mediation of a generic social democracy that leaves the capitalist market economy intact as it seeks to solve the problems of inequality through the stateʼs capacity to regulate and legislate. If this seems like a proper description of Western European societies like France, Germany, the Low Countries and Italy, the prospect of even a responsive generic social-democratic order dims considerably as one moves to the United Kingdom, the United States and Japan. Moreover, NAM is not misled by newer trends towards non-capitalist forms of associationism that will neither replace capitalism, as such, nor protect national and local economies against the imperial invasions of global capital. 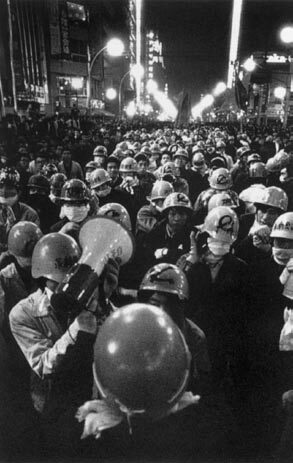 Instead, NAM calls for the implementation of a strategy of ʻcounter-actʼ (taiko) that is no longer rooted in the logic of a workerist paradigm and that effectively recognizes the emergence, since 1968, of incipient ʻanti-systematic movementsʼ – the wording is from Wallerstein – composed of students, workers, minorities of all kinds and consumers, that collectively represent a sustained effort to displace and even replace altogether the ʻhierarchical revolutionary movements of the past centered on vanguard parties and worker energyʼ. With the rise of these new identitarian constituencies (there is discernible here the lengthening shadow of Laclau and Mouffe), NAM sees the ʻregeneration of anarchismʼ – an anarchism clearly associated with the form of ʻassociationismʼ, inasmuch as both are antisystematic and opposed to the centralization of power, even though they are also too dispersed and fragmentary to provide effective counter-action. NAMʼs task is to recover the ethical vocation of socialism and to intervene ethically to destroy the ʻnatural historical structureʼ of capitalism – that is, the relation between capital and wage labour that presents itself as the product of a natural history of necessity. What NAM thus hopes to recuperate is precisely this ethical and contingent dimension that will put state and capitalism off centre by blocking the further accumulation of capital. In order to accomplish this goal, it proposes to combine newly formed and dispersed anti-systematic groups (any individual can become an associationist) in a new and expanding associationism. At the heart of this programme is the problem of surplus value, which NAM sees as a global phenomenon that can be used against state and capital accumulation. Capital exists in the movement of money to commodity to money and through the agency of an incessant transubstantiation it assumes – but only partially, it seems – a status of subjectivity. At the end of the cycle, when capital reaches the moment that announces the relative form of value – that is, pricing and selling – the worker now emerges to occupy the position of subject. What NAM is identifying is the place (ba) where commodities are sold and thus the place of ʻconsumptionʼ. While consumption for the capitalist is the point at which surplus value is ﬁnally realized, it is also where it is suborned to the will of the worker/consumer. For NAM, the worker is both a seller of labour power as a commodity and a consumer who is in a position to buy products. It is precisely this value-added dimension of subjectivity which, if I understand NAM correctly, saves the worker – and all of us – from total commodiﬁcation brought on by selling her/his labour power for wages through the exercise of a wilful act of being a consumer/subject who can choose whether or not to buy a product. And it is this decision and its consequential action that transports the labour movement from its local and constrained moorings to the global stage and transforms workers into a universal community of consumers. It is here that NAM condemns Marxism for having embraced the reiﬁed nature of consciousness that would work to deﬁne the privileged task of the ʻvanguardʼ to awaken workers from a ʻdaydreamʼ, but only at the risk of keeping a distance from them. It is interesting, if not enormously encouraging, to see the dismissal of this project and its desire to invest subjective agency in culture denied the worker (the object of which such critical intervention was supposed to redeem for revolution) now coming from a place – the world outside of Europe – that Western Marxism had always repressed and ignored. Yet it is not at all clear that the question of reiﬁcation is so easily resolved. Perhaps owing to the manifesto form of its document, NAM risks a kind of insularity in its lack of speciﬁc recognition of recent and ongoing consumerrelated movements that politically and philosophically share many of its own aspirations. Disappointing, too, is its virtual silence on environmental consciousness and its role in conﬁguring consumer action groups. In NAMʼs programme, the decision to buy or not (recalling earlier proposals by the Soviet constructivist Boris Arvatov and the Japanese urban researcher Kon Wajiro to supply subjectivity to consumers by rooting their decisions in the recognition of use-value) is exercised through the instrument of global boycotts, which, historically at least, and in the Gandhian example employed in the text, were always in the service of a national idea. More importantly, the boycott reﬂected a nonviolent disposition that corresponded more properly to a ʻwar of positionʼ, rather than the frontal attack demanded by the ʻwar of manoeuvreʼ and its penchant for violence. Finally, NAMʼs concern for organization and procedures governing the realization of genuine ʻparticipatory democracyʼ (Principle No. 4). leads to recommending an electoral process that will introduce a lottery in the ﬁnal instance, after a number of representatives have been elected to constitute a short list, in order to prevent an inescapable ʻbureaucratic hardeningʼ. NAM reasons that only through the pure contingency guaranteed by a lottery in the last stage of the electoral process will the new associa-tionism avoid ﬁxed centralization of power and predictable patterns of succession and thus possibly ʻlead further toward the dictatorship of the proletariatʼ. In its reading of political history the ʻtechnicalʼ origin of a proletarian dictatorship derives, like the power of the bourgeoisie in Athenian democracy, from another ancient Greek political practice, the lottery. to mark one hundred years since publication, on the work of Jean Luc Nancy and more general y in European philosophy. Panel sessions are one and a half hours long and may be made up of two or three presentations. Proposals should take the form of a title, names of participants and one paragraph abstracts of each presentation. Al participants must register for the conference.